Winter isn’t always the kindest to your health, and anyone who’s experienced the Christmas bloat can agree that the overindulgence at this time of year can leave you feeling sluggish, heavy and generally unhealthy. It’s good to treat yourself once in a while, but it’s also important to look after your health during the winter months to ward off pesky colds and flu. You are what you eat, right? Since 2017 was all about me getting healthier and more fit by changing the way I eat and live, I wanted to share some tips on eating healthier this winter. Vitamin C is essential for boosting your immune system, especially during the winter months. Dosing up on vitamin C can help protect you from colds and other viruses, while also giving you some much-needed energy. While oranges may be the first fruit that spring to mind, there are plenty of other fruit high in vitamin C such as kiwi fruit, strawberries, mango, and pineapple – which all make excellent smoothie ingredients. Pre-prepare some smoothie packs which you can freeze and use in the morning to give you an essential vitamin dose. You can do so much with smoothies, they are amazing. Think outside of the box, and don’t be afraid to add greens and other veggies in there, too. They taste great and can really offer you a balanced, super healthy drink/meal. Bonus: the milk will also offer you valuable vitamin D, which is in short supply during the winter (the best source is generally all that good sunlight). 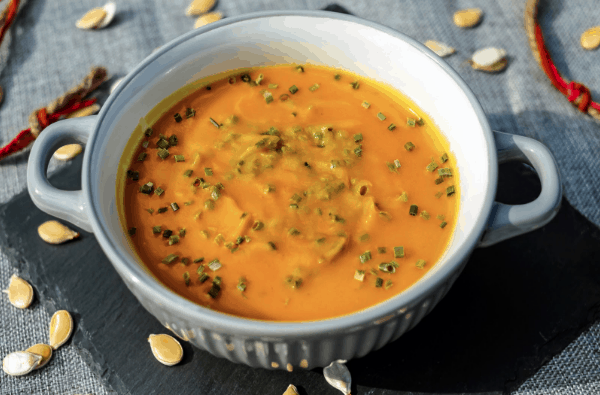 You can’t beat a batch of homemade soup as a tasty winter warmer, and most soup recipes are easy to whip up. The warmth is so comforting, plus it tastes fantastic, right? Imagine sitting next to a roaring fire, enjoying some gorgeous soup, dipping some delicious fresh bread, listening to some music. What, I ask, is better than that on a cold winter night?? The best thing about soup is that you can add some extra ingredients like calcium or protein to give them that something extra. Try an AlgaeCal recipe for a delicious broccoli and spinach soup which contains some extra calcium to help increase bone strength. Soups are an ideal way to use up leftover vegetables to help you limit your food waste. You can even stock up for future meals to make life easier on you by making extra and freezing the remainder to get you through the winter months. Instead of filling your plate with carbs this winter, get your nutrition hit from adding extra vegetables, beans, and pulses to your dishes. Meals like curries, stews and pasta dishes can all be made more filling by adding some thickeners of the food variety. Beans and pulses give you that extra dose of protein while adding some spinach leaves can help you boost your iron levels. There are great winter vegetable recipes for you to try that are perfect for warming you up on a cold winter’s evening. Plus, they are really tasty. When you’re seeking warming comfort food in winter, there’s always the temptation to pile your plate high. Fight the temptation, people. Be strong. While it might make you feel good for a short while, the bloating and sluggishness will soon take hold. Eat a regular portion, enjoy it, then give yourself enough time to realize that warm deliciousness in your belly really did fill you up. Foods that are rich in protein will make you feel fuller and give your body more of what it needs, while you can always add some extra vegetables to your plate to fill you up. Take your time and enjoy. By maintaining a good diet during the winter months, the whole family will feel happier and healthier. Try these simple tips to make weeknight meals fast and healthy and get cooking in the kitchen to enjoy healthier eating this winter. We make lots of soups in the winter time. They are a great way to eat right and stay warm at the same time. These are all awesome tips. I love thickening things with veggies instead of starches or flour. It’s so much healthier and it adds some great flavor, too! Thanks for these tips. My family and I take extra care not to get sick this winter season. We’re building up our immunity with healthier foods, taking supplements and probiotics, and getting enough rest/sleep. I will heed your advice too. Morning smoothies are always a healthy, yummy treat. I like the idea of keeping those portions healthy this winter. We do have to focus on our health since we’re not outside as much. Portion control is my biggest issue. I tend to eat healthy, but I also over do it on portion size. Thankfully, my husband is finally getting into eating right, so he’s helping me control those “fill your plate” urges. I love making soup this time of the year. I recently tried butternut squash with coconut soup and it is now my new favorite. Vitamin C is a great way to fight off colds. These are great ways to eat healthier this winter. I have been adding a lot more fiber to my diet. It’s the perfect season for soups and stews. Packing them full of super foods is a great idea. The broccoli and spinach soup sounds yummy!